Tip #173: Reroute your cables. They’re a ubiquitous feature of these old New York City apartments, cables snaking along baseboards and over doorways and tucked into the space where the ceiling meets the wall. Often they’re a vestige of outdated technology—twisted landline telephone cords have been coated with so many layers of paint that they’re hardly recognizable for what they are. (Part of the woodwork, you might say.) Always, they’re a vestige of someone else’s path of least resistance. For the first few years that we lived in this apartment an extra long cable was tacked along the length of our apartment and over the doorway to the bedroom. It was really two cords, joined together in the middle, and so an ugly coupler was also visible. It was an eyesore, yes, but more than that, it was totally unnecessary. We use the cable to power our internet and hook into our router; we didn’t need it to be an apartment’s length away from its source by the front door. Still, we lived with it, accepting it as one of the many things that we would have done differently if we owned the place, but we don’t and so, oh well. It’s easy to fall into a bit of complacency when renting an apartment; to sigh an Eeyore-ish “why bother” and move on to worrying about more important things, like how you’re going to pay for your rent. But then, sometimes it’s nice to put an ounce of energy things that are less worrisome and not at all complicated. Moving an exposed cable is as simple as removing the few tacks that hold it in place and rerouting it to a spot that makes better sense. After staring at the ugly cable for three years, one day we realized that of course, we could just move it. And so we did. The fix isn’t perfect. We didn’t bury the cable in a way that we might if we owned a place. The cable needs another tack over the bathroom door to make it sit flush, but it’s about ten times less noticeable in its new space than its old one. So, here’s a tiny reminder that sometimes thriving in a small space is as simple as making the walls you live in just a fraction more intentional. Sometimes it’s as simple as pulling out a few tacks and putting them back in again, somewhere new. 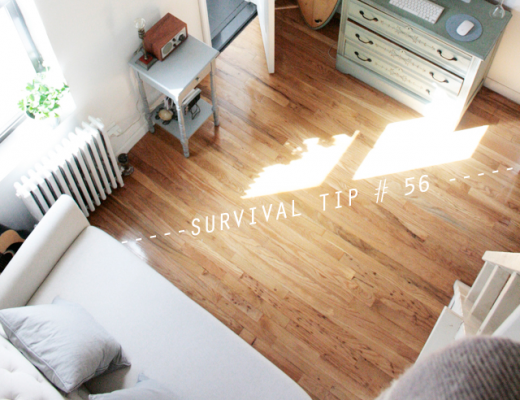 Tiny apartment survival tips #1-172. At this point, the entire family is outfitted with hats from Brookes Boswell. 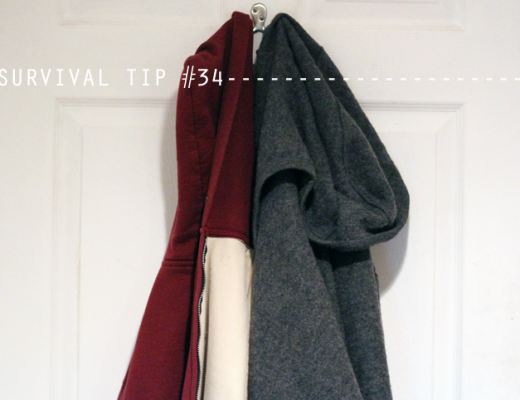 We hang them on the steel apartment door using magnetic hooks. Our white shelf is an old picture ledge that we painted ourselves. Here’s a white shelf that’s similar. 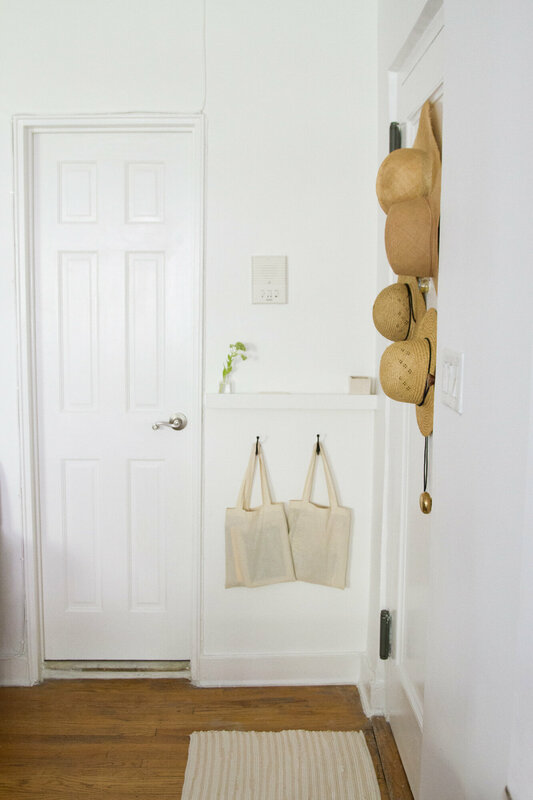 Our bags are simple cotton totes from Muji; our black hooks are from Schoolhouse Electric. What kind of tacks did you use? Just regular thumb tacks? We used these cable clips like these from the hardware store! This makes me smile because I *just* this morning spent 45 minutes nailing a grounded extension cord up and over a doorframe from our TV to an outlet in the same room, rerouting the cord from the path of least resistance (snaking around the doorjamb to another plug and making the door close wonky in the process) that we’d hurriedly fixed up when we moved in and never got back around to. We’ve been in our place in Astoria for 7 years and, like you said, have let so many little things like this slide because why bother? 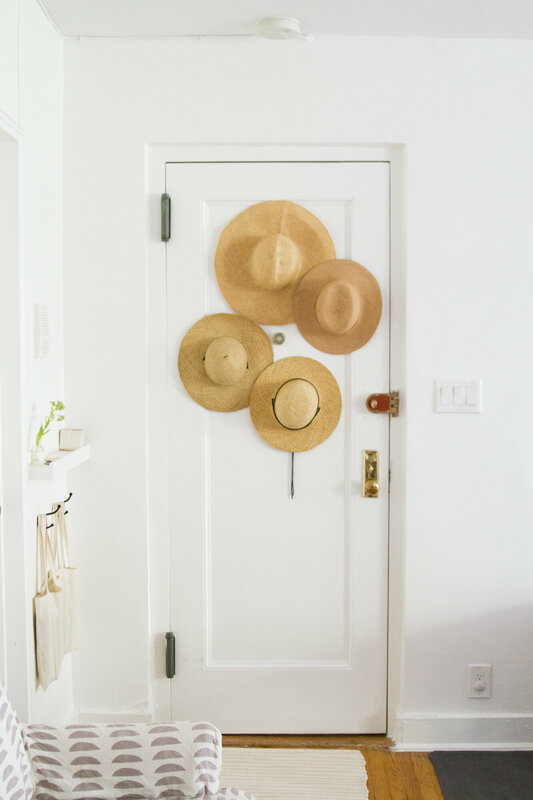 But, it immediately felt so amazing to put some effort into the little things – now when I look at it, I’ll remember how it matters to spend some effort toward your home, rented or not. If you do not need it, can you just delete it? Or put it in the wall? A shelf from the eaves near the door is a great idea, looks airy. I’ll try to do the same. We do need it! It powers our internet! Putting it into the wall requires a lot more construction work than we’re ready to put into an apartment we don’t own. I understand that you need to save money, but I always choose convenience. I can not calmly look at what is annoying. To keep the inner peace of mind, I have a router on a special white shelf under the ceiling near the front door. The Internet cable is connected to the router, WiFi is distributed to the whole apartment. It was necessary for him to make a separate electrical outlet near the ceiling. So satisfying! Your cable is barely visible. My little triumph like that this summer was to paint my utilities box (telephone, hydro) the same colour as the brick wall behind it. Ahhh. 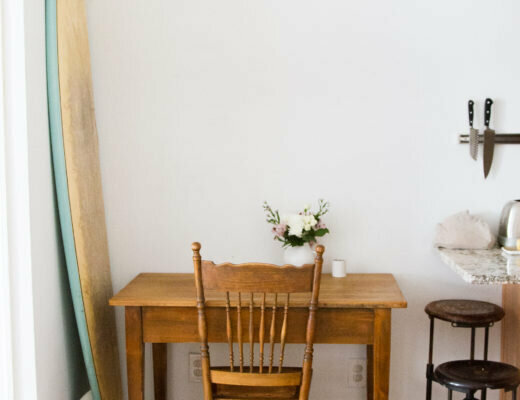 Years ago when I moved to New York City, my apartment was loaded with decades of old telephone wires, painted over a million times and stuck to the walls, snaking around all the moldings. I ambitiously ripped them out but when I finished and sat down to relax, call my sister and boast to her of my accomplishments, I found I had torn out the live wires as well. Phone company had to come in and hook me back up. Ha, ha. Ha! Clean slate at least! Just moved into a small(er than the last) place and spent a whopping $4 replacing all the gross, old cream outlet and light switch covers. It looks even better than I expected and took me such a small amount of time. So satisfying!